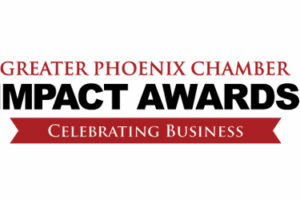 PHOENIX – Phoenix Children’s Hospital and Equality Health have been named the large and small/medium Businesses of the Year by the Greater Phoenix Chamber during the 31st Annual IMPACT Awards Luncheon held Thursday, May 24 at The Arizona Biltmore, A Waldorf Astoria Resort. “The Chamber’s Business of the Year award is a testament to the Phoenix Children’s staff. They fight to find solutions and are unwilling to accept life ending diseases. They do this so that children in Arizona and all over the country have a fighting chance. We went from a pediatric unit to what we are now–an internationally ranked, specialty pediatric hospital. We’ve created the highest level of training for pediatric specialists. Regardless of all that, nothing gives us more pride than caring for our community’s children,” said Bob Meyer, CEO of Phoenix Children’s Hospital. The two companies were selected out of eight local companies which are recipients of the Chamber’s IMPACT Awards, honoring the accomplishments of small and large Valley businesses and the positive influences they have on the business community and economy. Follow this link to watch a brief video highlighting each IMPACT Award recipient. In addition to honoring exceptional Valley businesses, the Chamber added the IMPACTful Nonprofit Award in 2016 to recognize the outstanding work of Valley nonprofits. This year’s IMPACTful Nonprofit Award recipient is Daring Adventures. The IMPACTful Nonprofit Award recipient is ultimately chosen by popular vote of the community. Daring Adventures was chosen this year from four deserving finalists, all of whom exemplify hard work and dedication to our community. The Chamber recognizes three outstanding elected officials with the Sentinel Awards, which highlight the great things that can be accomplished when business and government work together.